Remember: Here’s what we’re building - A Flask app that calculates word-frequency pairs based on the text from a given URL. Part One: Set up a local development environment and then deploy both a staging and a production environment on Heroku. Part Two: Set up a PostgreSQL database along with SQLAlchemy and Alembic to handle migrations. 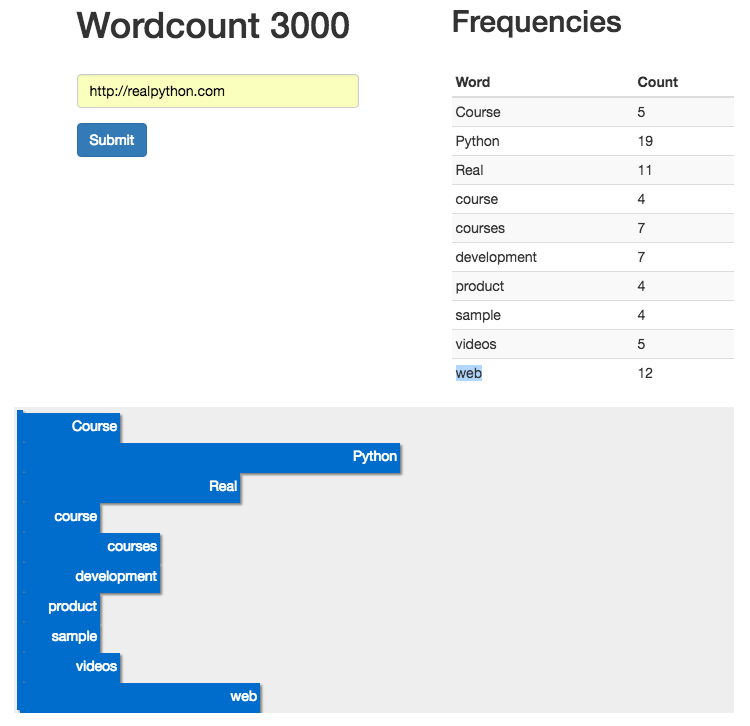 Part Three: Add in the back-end logic to scrape and then process the word counts from a webpage using the requests, BeautifulSoup, and Natural Language Toolkit (NLTK) libraries. Part Four: Implement a Redis task queue to handle the text processing. Part Five: Set up Angular on the front-end to continuously poll the back-end to see if the request is done processing. Part Six: Push to the staging server on Heroku - setting up Redis and detailing how to run two processes (web and worker) on a single Dyno. Part Seven: Update the front-end to make it more user-friendly. Need the code? Grab it from the repo. You should see your word counter working. Now we can add in a custom Angular Directive to display the results in a D3 chart. Now let’s set up a new custom Directive. restrict: 'E' creates a Directive that is restricted to an HTML element. replace: true simply replaces the HTML Directive with the HTML in the template. The link function gives us access to variables in the scope defined in the controller. Now, whenever scope.wordcounts changes, this function is fired, which updates the DOM. Since an object is returned from the AJAX request, we iterate through it to add the specific data to the chart. Essentially, every word is appended to a new div via a data join. Fire up the app in our browser. What’s happening now? When you search for a website, you should now see a grey area with some thin blue bars on the left hand side. So you can see that we are generating a bar for each data element we’re getting back - 10 in total. However, we need to modify our D3 code in order to increase the width of each bar so they are readable. The style is calculated by returning the value associated with each word, multiplying that number by 20, and then converting it into pixels. We can also add text to each bar element by inserting the string value of the word along with how often it shows up on the page. There’s still one thing missing though. What happens when you search for a new website? Try it. The new chart is appended beneath the previous one. We need to clear out our chart div before a new one is created. d3.select('#chart').selectAll('*').remove(); simply clears out the chart each time the $scope.watch function is fired. Now we have a chart that is cleared before each new use, and we have a fully functional word count application!! Want to help? Add a feature, write part 9, get paid, and become Internet famous!